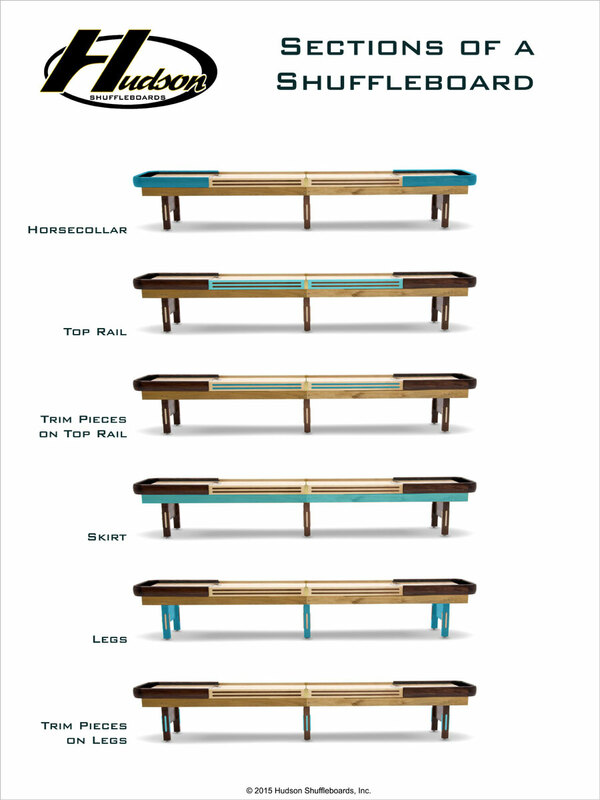 New from Hudson Shuffleboards! The Grand Hudson Deluxe Hybrid Shuffleboard is a beautiful work of master craftsmanship that features a timeless American look and made right here in the USA! The cradle on this Grand Hudson Deluxe Hybrid is constructed entirely of Solid Poplar and Hard-Rock Maple Hardwoods and finished with your choice of stain(s). Sparing no costs for quality, the 3” thick playing surface is constructed of select kiln-dried Hard-Rock Maple and topped with our Polymer Finish (lifetime warranty), which is the clearest Polymer on the market poured only by the best in the industry. This is the same finish insisted upon by the Professionals in tournament play. 20’ shuffleboard tables are very similar to 22’ tables; in that the plays required to score on them need to be cautiously executed. If a player wants to achieve a pro status, they will need to practice on tables at least this long. Also Included is One Set of Eight Playing Weights/Pucks, 2 Bottles of Speed Powders, Built in Protective Pads for the Ends of the Cradle, 5” Adjustable Leg Levelers, One Board Wipe, and One Can of Silicone Spray. And to help keep the playing surface true, climatic adjusters are included.